^ Hobson, Peter. "Currency shocks knock platinum to 10-year lows". Reuters. Retrieved 20 August 2018. ^ a b c CRC contributors (2007–2008). "Platinum". In Lide, David R. (ed.). CRC Handbook of Chemistry and Physics. 4. New York: CRC Press. p. 26. ISBN 978-0-8493-0488-0. ^ R. Grant Cawthorn (1999). "Seventy-fifth Anniversary of the Discovery of the Platiniferous Merensky Reef". Platinum Metals Review. Retrieved 24 December 2017. ^ Riddell, Imogen A.; Lippard, Stephen J. (2018). "Cisplatin and Oxaliplatin:Our Current Understanding of Their Actions". In Sigel, Astrid; Sigel, Helmut; Freisinger, Eva; Sigel, Roland K. O. (eds.). Metallo-Drugs:Development and Action of Anticancer Agents. 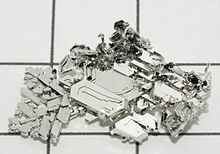 Metal Ions in Life Sciences. 18. pp. 1–42. doi:10.1515/9783110470734-007. ISBN 978-3-11-046984-4. PMID 29394020. ^ David A. Scott and Warwick Bray (1980). 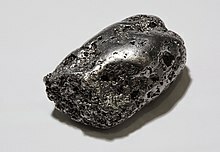 "Ancient Platinum Technology in South America: Its use by the Indians in Pre-Hispanic Times". Platinum Metals Review. Retrieved 5 November 2018.